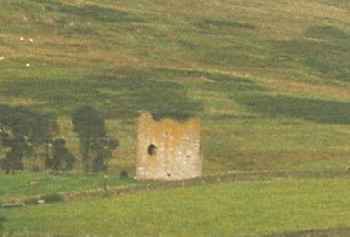 Dryhope Tower is a rectangular 16th century stone tower house, founded by the Scott family. On shelving ground that overlooks the steep gully of the Dryhope Burn, the three storey tower is pierced with gunloops and crowned by a guard house. The basement and first floor hall were vaulted and connected by a newel stair in the corner but the tower was slighted in 1592, after the Scotts were involved in a plot against King James VI. Rebuilt in 1613, with a later ground floor entrance on the north-east angle, the ground floor vault and the stair have collapsed but the upper vault is almost complete. An armorial panel dated 1613, with the initials for Philip and Mary Scott was above the entrance but is now built into a farm building. There is no indication of an encasing barmkin wall, the distance to the turf-covered banks of possible outbuildings, is to great for them to have any direct connection. 9 miles east is Kirkhope Tower and 10 miles north-east is Traquair House. Dryhope Tower is located north of Dryhope farm, off the A708. 16 miles south-west of Selkirk, on the A708. The site is owned by Philiphaugh Estate Trust and is visible from the road.